[BREAKING NEWS] Swine flu has made the jump from a “passive” to “active” epidemic. PAO researchers this morning made a massive discovery in the evolution of H1N1, also known as the dreaded Swine Flu. Formerly known as the Bird Flu, Swine Flu until now has been a slow spreading pandemic, passed only from human to human, after the intial pig-man spit swap that started this all. In this photo captured this morning, PAO has discovered that Swine Flu has now become “active”, meaning, its COMING FOR YOU. Initial conclusions are that the pigs are attacking our shores sporadically, coming from the tropics. 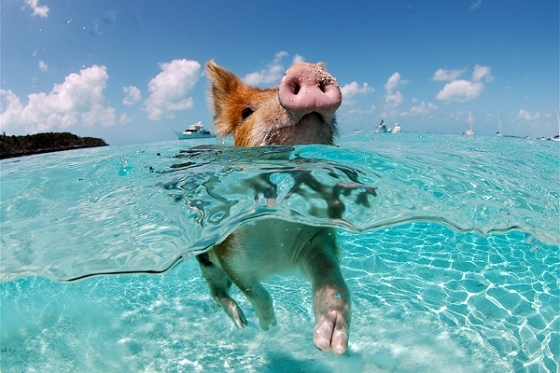 Beware – no matter how cute that pig is, if you see him at the beach, GTFO of the water. IMMEDIATELY.